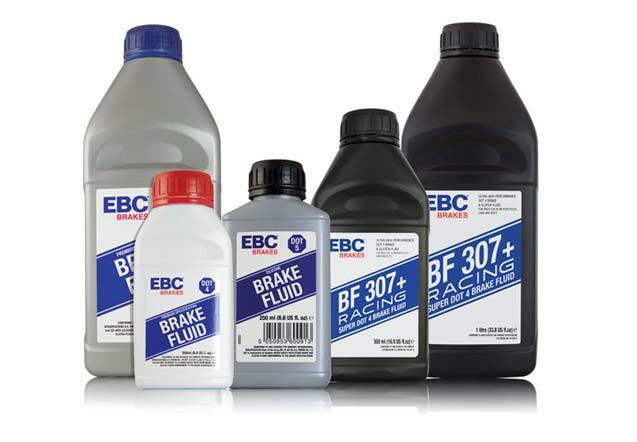 EBC Brake Fluid - Clutch Fluid for Cars & Motorcycles | Euro Auto Breakers & Engineering Ltd.
EBC's Dot 4 brake fluid is a premium quality glycol-based fluid for use in hydraulic automotive brake and clutch systems. 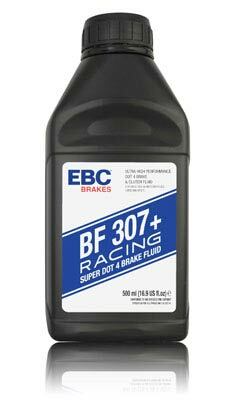 Specially formulated to provide optimum braking performance throughout a high temperature range, the BF307+ brake fluid is EBC's flagship racing brake fluid. Designed for extreme temperatures, this fluid should not be mixed with any other fluid. A complete system flush is necessary before application. Dot 4 LV is a brake fluid engineered to operate exceptionally well at low temperatures (max. cSt @ -40°C). This allows this particular fluid to be well-suited to vehicles fitted with ESP/ASR (Electronic Stability Program) systems. Dot 4 LV is designed to be used in the hydraulic brake and clutch systems of cars, commercial vehicles, and motorcycles requiring a glycol-based Dot 3 or 4 brake fluid. It can be mixed with other glycol-based brake fluids without issue. EBC's Dot 5.1 brake fluid is designed specifically for vehicles requiring a non-petroleum based brake or clutch fluid. Dot 5.1 has a boiling point that is significantly higher than standard Dot 3 and Dot 4 fluids, and is therefore engineered to perfectly compliment the needs of modern high-performance cars and motorcycles and/or vehicles fitted with ESP/ASR systems. Dot 5 Silicone brake fluid is a very high quality fluid engineered with silicones, which, unlike standard brake fluid, does not absorb moisture from the environment. This means that a much longer lifespan is expected, with a constant level of braking performance maintained. On top of this, corrosion of internal braking systems is highly reduced, due to the reduction in moisture ingress. This type of fluid is suitable for use in any vehicle requiring a non-petroleum based fluid. However, it should never be mixed with any other type of fluid except silicone-based Dot 5 fluid.